I did it. 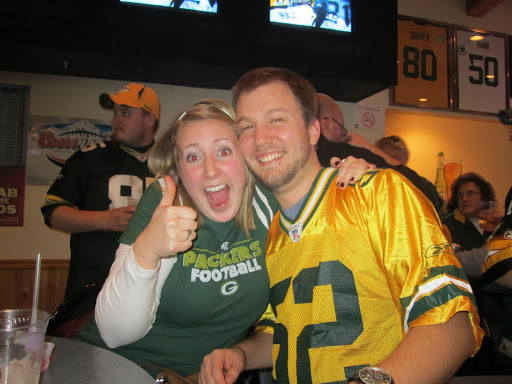 I single-handedly got the Packers to the Superbowl. 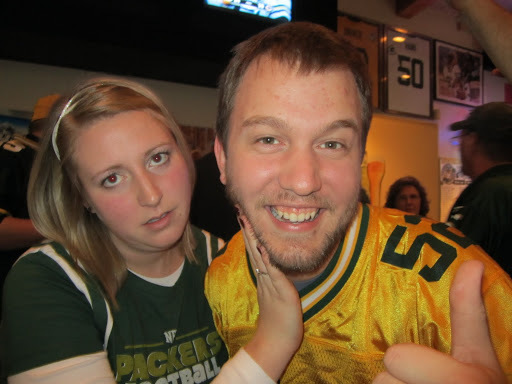 All because I bought a Packer t-shirt. On Sunday, Peter (More than EVER I want to keep referring to him as Skywalker, but I won’t.) and I made our way to Wrightstown to meet up with some amigos of ours (I will admit that they started out as his friends, but I’m so AWESOME that they like me better than him now, and when they invite him places, they say, “You can’t come unless you bring Sara.” And they’re SERIOUS. I just KNOW it.) to watch the BIGGEST game of all time: the Packers vs. the Bears (in case you didn’t know…). We got to the bar an hour and a half before the game. Whaaaaaaaaaaaaat? Yes. Because they had the most amazing drink special EVER – you pay one price, depending on how early you get there, and can drink all you want, of almost whatever you want. So for $6.50, I had more drinks than I needed (Brandy Old-Fashioned super sweet, anyone? Oh YUM), and so did most other people there. Every touchdown was a jello shot. The win was two. THOSE were yummy too. There was screaming. There was table-pounding. And then, there was beard rubbing. Peter, in all of his wisdom, thought it would be fun to grow a “playoff beard”. It didn’t start until a week ago (“Because being the wildcard isn’t REALLY the playoffs, but now they’re like, fighting for the Championship, so it’s a playoff beard.”), and he didn’t call it the playoff beard until Sunday. And let me tell you what. The men in the group we were in LOVED it. First, they were impressed that Peter is such a man and can grow a beard that fast. I grew up with the manliest of men: an almost 22 year old brother who shaves every other week, but you can’t even tell; a 26 year old brother-in-law who tries to pull off a goatee, but doesn’t REALLY succeed; and a 52 year old father whom no one has ever seen with facial hair. So when I see Peter at 8 o’clock at night and say, “Oh, you didn’t shave today?” and he responds, “Yeah, I shaved this morning.”, I am shocked EVERY time. A 5 o’clock shadow really DOES exist – I apparently never hung out with the right people. Every time there was an AWESOME play by the Packers, most of which I missed but DID catch on the re-play (not that I knew what was going on anyways…), everyone reached for Peter’s face. My eye-rolling didn’t start until people told ME to rub the beard. No. I will not. I do NOT support the playoff beard, and Peter knows this. When the Packers won the game, it was because of the beard (I didn’t tell anyone about my t-shirt – the REAL reason for the win). Not only were people smashing mine and Peter’s faces together so that I could REALLY feel the beard, people WITHOUT beards were smashing THEIR faces against mine saying, “Feel the beard!! !” WHAT beard? With all this face-smashing, I started looking around at the “normal” people in the bar, and then I got scared. Someone was STANDING on a HIGH chair at the table behind us. I almost went DEAF from all of the screaming that was going on. Hugs became suffocating embraces, and high-fives became hand-numbing slaps. In all honesty, it’s a lot easier to get into the game when you’re in a mob of hyped up people than when you’re sitting next to your boyfriend who keeps interrupting your reading.